Home > News > Random Thoughts > The Benefits of Twitter – Must Twitter Fish Fight! Tweeting is one of the easiest and in my opinion one of the fun ways of keeping abreast of news, promoting your business, keeping a record of daft thoughts and picking up the thoughts and ideas of some fantastically clever people. You can follow people you find interesting and then unfollow them if they start to become a bit to mundane with their posts. The great thing that is their choice to write what they want and it is your choice to read them if you want to. In my case, I tend to follow comedians, entrepreneurs and people who might have something to say that interests me. I have used it to meet new contacts that may be useful to growing my business. I will often retweet bits of information that I have found useful and have entered numerous quizzes and competitions. I have been fortunate to have won a famous book on Geordie humour: The Fairly Truthful Guide to Geordie. I enjoyed his work so much that I decided to meet him personally, bought more books to give away as presents and we may end up doing some further work together. I also won a 14″ canvas print from a company called Crafty Canvas. I decided to get print done from one the images taken on my Trip to Everest Base Camp last May. It should arrive any day now and will undoubtedly lead to me purchasing a few more in the next couple of weeks. I am a great believer of throwing out sprats to catch a mackerel. That reminds me, if you have not already done so then please check The Fish Fight Story website, more than 550,000 people have signed up to highlight their disgust at the waste that goes on in the fishing industry due to the rules that our elected parliaments made and now allow to happen. Tweeting can prove to be interesting, I set myself daft targets to get retweets or messages from some famous tweeters. I managed to get Alan Sugar to respond to a question. On the The Apprentice TV show, he said the “Early bird catches the worm”, so I responded that “The second mouse gets the cheese”. His direct response was “Never pat a burning dog”. Not quite as famous as King Eric’s: “When the seagulls follow the trawler, it’s because they think sardines will be thrown into the sea. thank you very much”, but it was just as strange. I have always said that the simple things keep me happy, and twitter is so simple. I hope to pick up the other Dragons comments in due course as a bit of fun. I have to say that today I got a follow out of the blue from Duncan Drasdo – the CEO behind the MUST campaign to free Manchester United from the Glazers. I have followed Utd for more than 40 years and I really believe that most fans whatever their allegiance would like to have more fan power within their clubs. Football is being ruined by mismanagement all over the country. I find it hard to call football a business, its not like any business I would run. I was reminded of my own crowning achievement of last year, so I decided to post the image above. 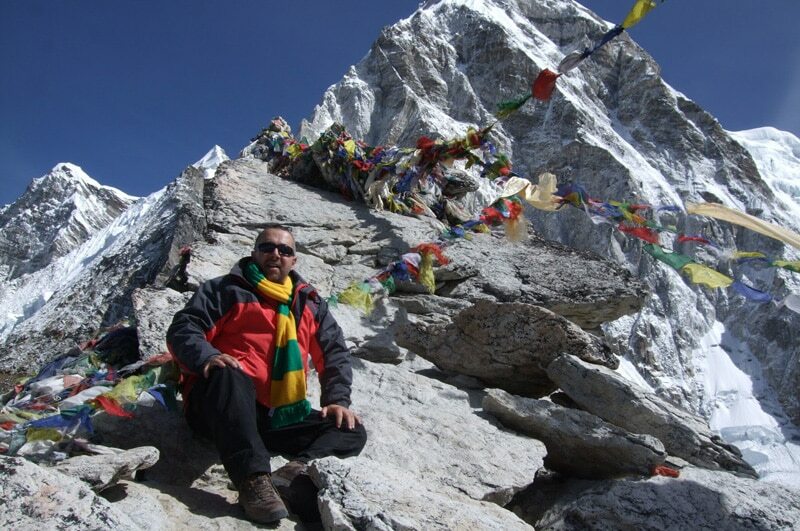 It is of me sitting at the top of Kala Patthar at a height of 18,200 feet, proudly holding the green and gold scarf aloft. I left the scarf with one of the Sherpas, so it this being now being worn up somewhere up in the Himalayas as we speak. Twitter is like that, it can take you in a million directions without moving from your desk. If you disagree strongly with any of my comments then don’t worry just switch off, but if you found any inspiration then great.